The common sentiment of many Chinese is that if Westerners stop eating beef, East Asians and Southeast Asians will stop eating dogs. But livestock treatment in the West is much improved over many Asian practices and it is legal and regulated in the West whether you agree with it or not. In China, where dog meat consumption is rampant, many of the dogs, which go for 60 dollars or more per animal, have been smuggled across country borders and have made their way on to dinner plates and in soup bowls after being bludgeoned to death. Although some locally adapted breeds have been used solely for their meat, many pets are been abducted and ultimately tortured for food and medicinals. In fact, inducing the release of stress hormones in dogs placed in cramped wired cages is said to enhance the quality of their meat, according to the ancient practice. It is hard to reconcile and comprehend because like much of the world, East Asians are avid pet dog owners. The booming dog meat market in Korea and China is huge and largely unregulated and has spawned much criminal activity. Koreans and Chinese together comprise a population of over 1.4 billion people, and if one considers that many citizens regularly consume dog as a delicacy, and most other East Asians have tried it at least once in their lives, the number of dogs impacted by the barbarically cruel dog meat trade is unreal. On the Korean Peninsula, dog meat is commonly harvested from "Nureongi." Nureongi or yellow dog is a breed of locally adapted livestock dog to be distinguished from pet canine breeds. Not only is the ancient practice of eating dog meat or "Gaegogi" alive and well on the Peninsula, many Koreans would like to open the market for dog meat to Westerners. Thai dogs, commonly known as soi dogs, make their way to restaurants in Vietnam packed alive 20 to a cage. Some have their legs broken to make it easier to bludgeon them to death while others are mutilated and skinned alive. I saw one video a few months ago of a dogs being beaten while burning. It was so horrendous that the video was banned on some social media sites. Although, harvesting dog meat for both cuisine and medicinals is not as well documented in North Korea, for obvious reasons, canine cuisine very much remains a delicacy above the Korean Demillitarized Zone. It is fair to say that different cultures observe traditions that might be incompatible with lifestyles from elsewhere in the world, but the fact is that whether you think of a dog as a companion animal or a food animal, they are being brutally tortured. And it is without regard for whether they are feral dogs, stolen pet dogs from "forever homes" or bred for their meat. The dog meat trade is not just something that doesn't sit well with the international community or isolated to East Asia. The trade is a global one and is often comprised of criminal activity in various regions of the world where it persists. Even here in the US the slaughter of man's best friend is not just of folk lore or associated with our early descendents, it is a legal practice in 44 states. Dog meat is still consumed in West Africa, Europe, Oceania, but eating dog is still most prevalent in Asia where one account suggests that a dog is slaughtered every 13 seconds. And according to No To Dog Meat, an organization, which raises awareness concerning the dog meat trade and cruel harvesting practices around the world, in China alone, 10 million dogs are rendered at butcheries every year. In China, the hosts of the well-known Yulin Dog Meat Festival are known criminals who reportedly process 10,000 dogs just for the one event. Some dogs of impressive pedigrees go for lots of money. 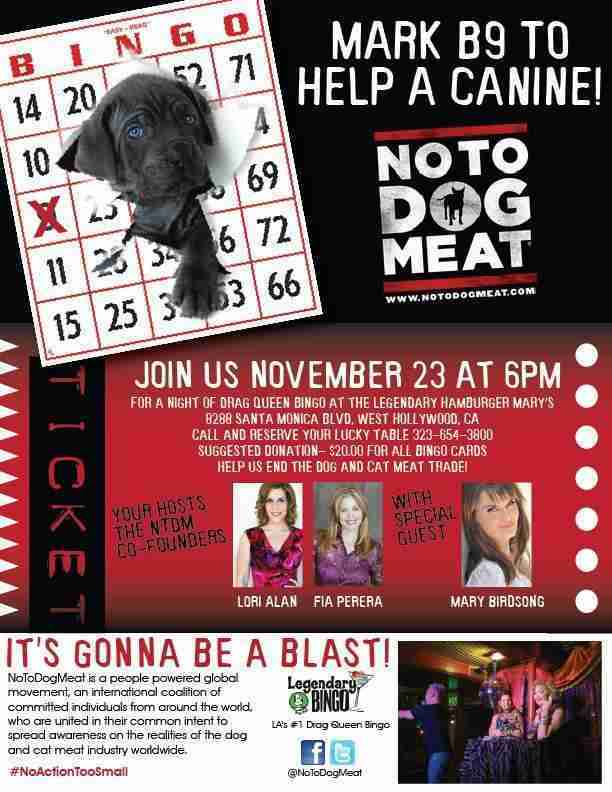 Next week, the US Chapter of No To Dog Meat is hosting a fundraiser headed by Fia Perera, which raises monies to help ban annual dog meat festivals, like the Yulin Dog Meat Festival. Funds will also help provide veterinary care and permanent homes for dogs in desperate need of intervention.